Why should I register my Bandname? We created bandnamevault.com to help bands, musicians and performers protect their chosen stage names, associated careers and earning power. It is very common in the entertainment industry to find another band or artist using your stage name. They may be using the same name without even knowing about you. This can lead to costly disputes and legal action. Defending these legal cases can be difficult, time consuming and expensive. In the worse case you may have to stop using your chosen name and choose another - even if you thought of it first! Musicians – who owns the rights in the band’s name? Having to change your name can be devastating for a new band or artist early in their career as your fans are no longer able to find and support you or your work. Automatically searching the web’s largest databases of bands, recording artists and performers. Before we allow any name to be registered in Bandnamevault.com, we check iTunes, Spotify, Songkick, Musicbrains and other services to find out if any other artist is using or has ever used that name in the past. Once we accept your Bandname for registration in Bandnamevault.com, we use the latest Blockchain technology to create a permanent, auditable, immutable record of your claim to this name. Helping establish your Prior Use and Good Will around the use of your chosen Bandname. Using Bandnamevault.com allows you to continually update and keep records of the gigs you perform, records you make and any promotional appearances or update you make. Our Gigs and Milestones feature is designed to keep your claim of a name completely up to date and current. Registration is simple and free, why not start now! I am a solo performer, can I still use Bandnamevault.com? Yes you can! As a solo performer it is just as important that you protect your stage name. You can use exactly the same service on Bandnamevault.com as a band or group. Can I register a name that is already present in the Database? Unlike some other name registration services, we will do not allow multiple registrations in our database. Once we identify a name is, or has been in use, we will not allow a second registration. If you feel that the name you would like is dormant, or unused. If that name has been registered with Bandnamevault.com, you can use our Connect me service, to contact the existing owner of the name registration to see if they would be willing to transfer it to you. Any commercial arrangement you make between owners is at your own discretion. Please note that we will deliver any message you send via our Connect me service, but bandnamevault.com cannot guarantee the existing registrar will respond or reply to your enquiry. Can I change a name I have created in the Database? No, once you have created a name in the bandnamevault.com database it becomes a unique record for life. The bandnamevault.com bandname record can not be changed or edited. You can change certain information relating to the supporting information around your name, such as website address or social media account, but the name itself is unique and will always exist in our records. You are free to create any number of new name records you like, each new name registration costs a one time payment of $15. There are multiple members in our band, who can edit the registration? The person, whose name is on the account that paid the $15 registration fee, is the owner of that name in our database and only they can make edits or amendments. When you register a Bandname, you can add the names and contact details of all the band members, however the person whose name was used to originally open the account, will be the owner of that registration. If you wish to change the registration, you must contact the registration owner. If you have lost contact with the registration owner, you can use our anonymous Connect me service. This will anonymously send your message to the current registered owner. It is entirely at the discretion of registered owner if they reply to your message. Bandnamevault.com is simply a data repository and record service, we cannot get involved in disputes between band members. If you are involved in a dispute we recommend you seek your own legal or professional advice. There are multiple members in our band, who owns the registration? The person, whose name is on the account that paid the $15 registration fee, is the owner of that name in our database. When you register a Bandname, you can add the names and contact details of all the band members, however the person whose name was used to originally open the account, will be the owner of that registration. If you wish to change the owner of the registration, only the registration owner can use the Change ownership function on the my account page. The person that registered our Bandname is no longer in the band, how do we update the details? At Bandnamevault.com we consider the registered owner of a registration in our database the person who paid the initial $15 registration fee. If that person leaves your band, or is no longer responsible for maintaining the Bandnamevault.com detail, they must use the Change ownership function to transfer the regsitration ownership to another member. Please note Bandnamevault.com can not get involved in disputes regarding ownership of registrations, we will simply assume the registration owner is the person who paid the original $15 registration fee. Can I change the ownership of a name I have already registered in the database? Yes you can. Please log into your account and use the Change ownership function. We will need to verify you are the existing owner and we will need the new owner have an account with us. You will be charged $25 for the change of ownership service. Our band is dormant or no longer performing, can I sell my name registration to somebody else who wants to use the name? Yes you can. Our Change ownership function allows the registered owner of a bandname to transfer it to another bandnamevault.com account holder for a $25 fee. If you are planning to sell a registration you already own to another user, you should consider this cost in the sale price you agree with them. Bandnamevault.com does not get involved in the commercial agreement regarding the sale of bandname registrations between owners. We simply make a fixed, one off charge for the change of ownership. How can I contact other owners of registered Bandnames? If you find a Bandname you really like, and the name is part of our Connect me program, you can contact the existing owner of the bandname registration to see if they would be willing to transfer it to you. Any commercial arrangement you make between owners is at your own discretion. Please note that we will deliver any message you send via our Connect me service, but can not guarantee the existing registrar will respond or reply to your enquiry. What are Gigs and Milestones? The two most important things in preserving your Bandname are Prior Use and Good Will. These two legal concepts rely on proving you were using the Bandname on specific dates and that you were using the Bandname for a positive purpose, i.e. you were not deliberately trying to reuse or copy or imitate another band’s name. By using Bandnamevault.com you get an immutable, permenant, unchangable record of your claim to a Bandname and a date that you started to use it. Our certified Blockchain record gives you robust legal proof of your use of that name at a particular moment in time. By using our Gigs and Milestones feature you can also add details of any live events, showcases, recording or other appearances your band has made. Each of these events will be stored in our Blockchain and will be stored with a certified record of the date and any other links or details you provide to support the event. The more events you record for your band, the stronger and stronger your case for good will and prior use becomes. We sell packs on Bandnamevault.com event registration, 10 event registration cost $15, please follow this link Gigs and Milestones to make the purchase. Event Registration packs can be purchased anytime after your initial Bandname has been registered. Blockchain is a new technology that was developed as part of the Bitcoin electronic currency. Blockchain technology uses the robust nature of the internet to create a permanent electronic record of data. This allows Bandnamevault.com to create an immutable, permanent, auditable record of your registration of your Bandname, details and activity. This gives you a trusted third party auditable record of your claim of Prior Use and Good Will around a particular Bandname. You can read more about Blockchain technology here. You can see data of all types been written to the Blockchain here. How do I make payments on your service? At Bandnamevault.com we have partnered with a company called Stripe.com to handle all of our credit card transactions. Stripe.com is one of the world largest electronic payment service providers and powers many major ecommerce sites on the web. You can learn more about Stripe.com here. What is Prior Use and Good Will? In simple terms Prior Use is the fact that you were actively using a Bandname from a particular date in the past. The immutable, unchangeable Bandnamevault.com blockchain records give you this third party verified auditable proof of use. If you use our Gigs and Milestones feature, you are further able to prove your usage of the name, by providing the same immutable record of events, products and performances you have made using that Bandname. Good Will is showing that you were not using the Bandname in malice or to mimic, copy or undermine the value of another artist of band with a similar name. In the event of a legal dispute about the use of a name, your ability to demonstrate when and how you used your Bandname is key in defending your rights and the value of your Bandname and reputation. Bandnamevault.com gives you clear, immutable, proof of usage to help your lawyers and advisors defend your rights. Do I still need to apply for a Trade Mark if I have registered my band's name in Bandnamevault.com? Bandnamevault.com is a global service and trade mark registration is a legal process governed by each country jurisdiction where it applies. Registering your band’s name in Bandnamevault.com is not the same as applying for or being awarded a local Trade Mark. Using a Bandnamevault.com registration can help you establish prior usage or goodwill around the use of your name in the event of a conflict with another band, or should you ever wish to apply for a local Trade Mark. Because of the complex and country specific nature of Trade Mark’s only a qualified lawyer in each relevant country can advise you on the issues surrounding your specific dispute. Another band is using our name, what do we do? At Bandnamevault.com we make every effort to help bands avoid a situation where they are both using the same name. We only allow one Bandname to be registered in our database, and before we permit any new registrations, we search the web looking for current or previous usages of that name. If you find that another band is using the name you have already registered on bandnamevault.com, you should take legal advice immediately. Take copies of all of your bandnamevault.com certificates, to show your original registration, any amendments you have made and record of Gigs and Milestones. Your legal advisor will be able to use these records to review and defend your claim. At Bandnamevault.com we are purely a registration and data management service. We are unable to get involved in any disputes directly. To change your personal details such as email address or other contact details, please Login to your account and click on your name on the top right of the page. If you have forgotten your login email address or password, please reset it here. Why should I add extra information like my address to my Bandnamevault.com account? Preserving and protecting your chosen Bandname is all about demonstrating two legal concepts, Prior Use and Good Will. The more information you provide about yourself the more credible and protected your Bandname is if there is ever a dispute. We encourage all of our members to complete all the details in the registration section of our site. Do I need to keep my information up to date? Please login to your account from time to time and make sure all your details are correct and up to date. Even if your band breaks up, or stops performing together, you will own the registration of that name in our database. Our Connect me feature could allow other people to contact you with enquiries to purchase your registration. I’ve lost the original email receipts of my registrations and updates, where can I get copies? At Bandnamevault.com we keep copies of all of your registrations, Blockchain receipts and Hash Values for every Bandname you register, amendment you make or Gigs and Milestones you register. To see all this information, simply log into your account, go to Home page and you will see every registration. How do I contact the owner of a band name? Our contact me service allows you to search for a Bandname, and if it exists as a registration in Bandnamevault.com, you can anonymously contact the owner of that registration. You may wish to contact the registration owner for any reason. You might want to book the band for a gig, audition to become a band member, contact an old friend or even enquire about buying the name registration. 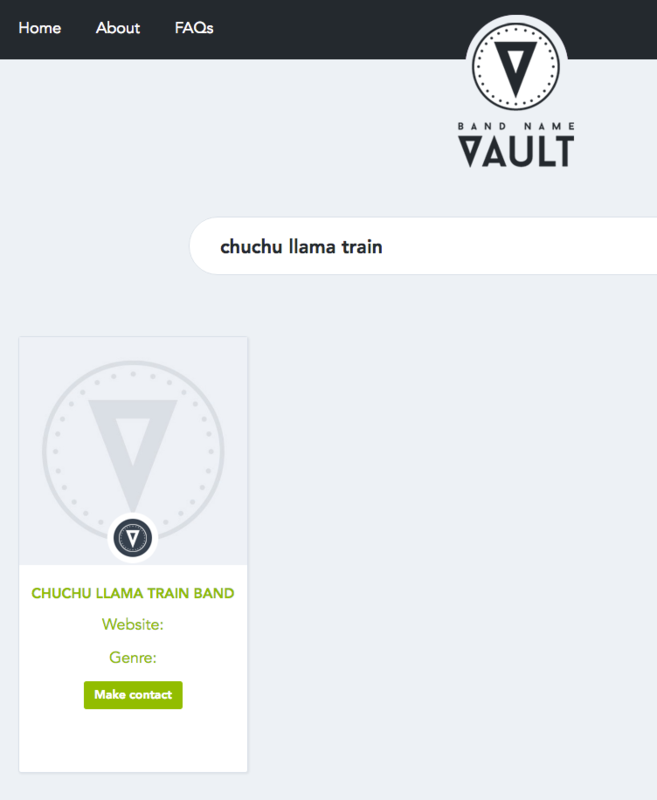 To use the service, simply log in, and search for the Bandname you are interested in. To use the Contact Me service, the name must be registered as unique with Bandnamevault.com. This means you will not see the option to use Contact Me with results we have found on iTunes, Spotify or the other databases we inspect. If the name is registered in our database you will see the Contact_me button highlighted on the results page, see the example below. Click the button to start the process of sending your message. We cannot guarantee that the registration owner will reply to your request, at Bandnamevault.com we simply pass on the message!